Only 2 Work Truck models left in stock! New vehicle pricing includes all offers and incentives. Tax, Title and Tags not included in vehicle prices shown and must be paid by the purchaser. While great effort is made to ensure the accuracy of the information on this site, errors do occur so please verify information with a customer service rep. This is easily done by calling us at (863) 294-7371 or by visiting us at the dealership. Bed Liner, Trailer Hitch, Turbo Charged, Back-Up Camera, 4x4, AUDIO SYSTEM, CHEVROLET INFOTAINMENT. ENGINE, DURAMAX 6.6L TURBO-DIESEL V8. BED LINER, SPRAY-ON, MIRRORS, OUTSIDE HEATED POWER-ADJUSTA. WT CONVENIENCE PACKAGE. WHY BUY FROM CHEVROLET CENTER? Carrying on the family tradition, Sam and Frank Portlock have dedicated themselves to creating an environment where customers are welcomed like family. We have achieved top customer satisfaction from the beginning, and we continue today. Same Name. Same Ownership. Same Great Service. Your Center for Chevrolet Since 1958. With seek-and-scan and digital clock, includes Bluetooth streaming audio for music and select phones. Pickup box bed liner with bowtie logo. Liner is permanently bonded to the truck bed providing a water tight seal. The textured, non-skid surface is black in color and robotically applied. Spray-on liner covers entire bed interior surface below side rails, including tailgate, front box top rail, gage hole plugs and lower tie down loops. Includes Hitch platform with tray to accept ball and drilled box holes with caps installed, box mounted 7-pin trailer harness (similar to (UY2) harness). Includes 18" x 8" (45.7 cm x 20.3 cm) steel spare wheel. Spare not included with (ZW9) pickup box delete unless a spare tire is ordered. 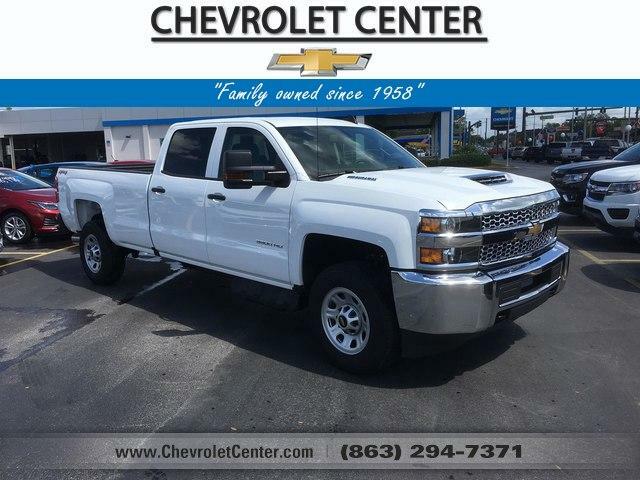 Chevrolet Center offers a huge selection of new vehicles to Haines City Chevrolet customers. We offer the Cruze, Malibu and Camaro for Tampa, FL Chevrolet drivers. Of course, we offer many other cars as well, and if we do not have the new or used vehicle of your choice in stock, normally we can get it and deliver that vehicle to you at the same low price! We also have the Equinox, Suburban, Tahoe and many more, ready for Haines City and Orlando, FL Chevrolet enthusiasts to drive home. Although every reasonable effort has been made to ensure accuracy of the information contained in this site, absolute accuracy cannot be guaranteed. This site and all information and materials appearing on it, are presented to the user – as is – without warranty of any kind express or implied. All vehicles are subject to prior sale. All new vehicle prices include and are after applicable rebates and are subject to change without prior notice. Not everyone will qualify for all incentives. Prices do not include applicable tax, title, license, processing/documentation fees.